Police say 15-year-old Derek “Peachy” Juarez-Lopez was killed after he was lured to a West Seattle park by a group of teens intent on robbing him of marijuana. Two juveniles were charged in adult court with first-degree murder on Friday alongside an18-year-old man in connection with the stabbing death last month of a 15-year-old boy who police say was set up and robbed of marijuana. Prosecutors have requested that all three suspects be ordered held in lieu of $1 million bail for allegedly luring Derek “Peachy” Juarez-Lopez into the woods of Westcrest Park in West Seattle on Sept. 5, and then stabbing him with a knife when he refused to hand over his pot. His backpack was stolen after he was attacked. “The three defendants then left Derek to bleed to death. They have shown no remorse, and instead made efforts to cover up the crime,” Senior Deputy Prosecutor Brian McDonald wrote of the three suspects. The three defendants are Jonatan Islas-Martinez, 18; Elizabeth Cabrera-Aparicio, 17; and Diego Carballo-Oliveros, 16. All three were arrested earlier this week. The Seattle Times generally does not identify juveniles accused of crimes unless they’re charged in adult court. 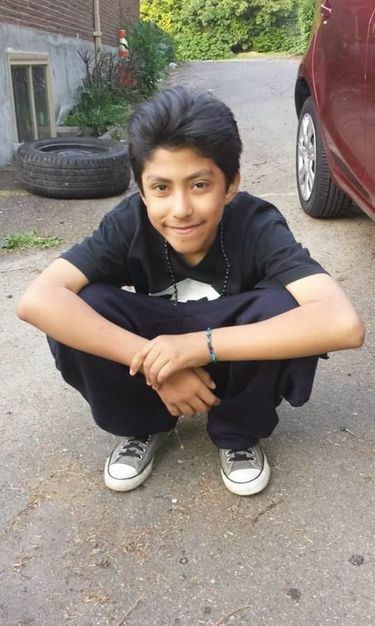 While Seattle police initially thought a fourth teen was involved in Juarez-Lopez’s death, the charging papers say that boy was instead a witness who didn’t know the others had planned a robbery. Other witnesses, who saw the male suspects immediately before and after the homicide, also provided statements to police. Cabrera-Aparicio, who is described as Carballo-Oliveros’ girlfriend, is accused of luring Juarez-Lopez to the park, where he expected to sell an ounce of marijuana to the two males, the charges say. According to the charges, Carballo-Oliveros demanded Juarez-Lopez give him a jar of marijuana, and when he refused, Carballo-Oliveros flipped open a knife and thrust it into Juarez-Lopez’s abdomen. Juarez-Lopez was also stabbed in the chest and was “curb stomped” after being pushed to the ground, the charges say. Carballo-Oliveros stood over him and said, “That wasn’t supposed to happen. I don’t want to have to kill you,” before he ran from the scene, say charging papers. Carballo-Oliveros lives two blocks from where Juarez-Lopez collapsed at 6th Avenue Southwest and Southwest Cambridge Street, court records show. He was charged last year in juvenile court with first-degree robbery and first-degree attempted robbery, both of which involved a knife and juvenile victims, charging papers say. Another youth has since come forward to report he was robbed a year ago by Carballo-Oliveros in Westcrest Park, say the charges. Islas-Martinez and Cabrera-Aparicio both live less than a mile from where Juarez-Lopez was attacked. Juarez-Lopez died hours later at Harborview Medical Center, a day before he was to begin his sophomore year at Chief Sealth International High School, his family said.